Greg Ruby and The Rhythm Runners will perform unrecorded songs by Seattle jazz pioneer Frank D. Waldron in upcoming Pacific Northwest performances, including concerts on March 23 at Century Ballroom and March 24 at Cornish College of the Arts. 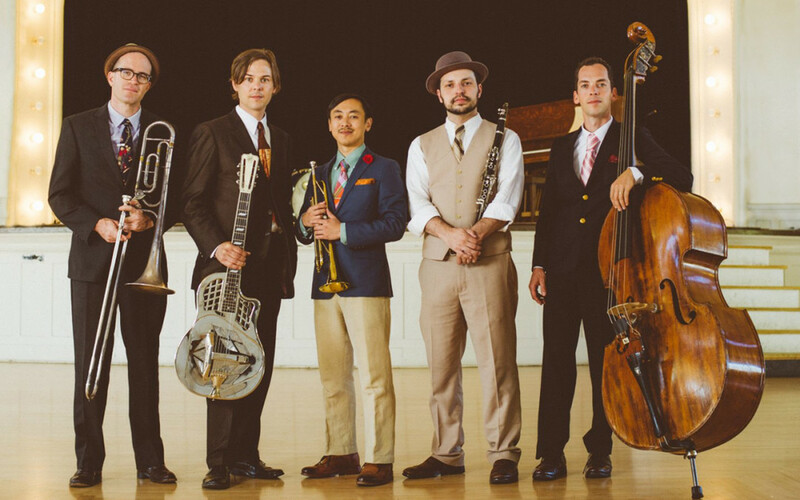 The Rhythm Runners’ inception launched from a chance meeting in 2012 between Seattle jazz guitarist Greg Ruby and New York multi-instrumentalist Dennis Lichtman and their mutual love of Prohibition Era Jazz. The two musicians soon joined forces with New York trumpeter Gordon Au, trombonist Charlie Halloran and bassist Cassidy Holden both from New Orleans, and Bellingham drummer Julian MacDonough. With the Rhythm Runners in mind, Greg Ruby began a project in 2014 to commemorate Frank D. Waldron – saxophonist, cornetist, composer, bandleader, and teacher to Quincy Jones, Buddy Catlett, and others. What Ruby discovered was that Waldron left behind a singular, important artifact from his early life: Syncopated Classic, a collection of compositions published in 1924 intended for saxophone pedagogy. Ruby began making arrangements of the music found within Syncopated Classic, finding himself relocating missing pieces from a weathered photocopy of the 32-page document. Supported by 4Culture grants, Ruby additionally put together a complete history of Waldron’s life, presented lectures at Seattle Public Libraries in February, and now is performing his reinterpretations of all nine compositions found within the book. Ruby describes his findings in Syncopated Classic as complete sketches, originally written in standard notation with a treble melody line and piano accompaniment. “The intention of the composer is very clear throughout,” says Ruby, noting that all the necessary information needed to detect intricate countermelodies, bass action, and rhythmic obscurities is present in the manuscript. Waldron’s Syncopated Classic serves as a rare and immediate connection to the roots of Seattle jazz. From composing and teaching in his studio at 1142 Jackson Street to fronting the Odean Jazz Orchestra at the Nanking Café in downtown Seattle in the 1920s, Waldron’s influence is embedded into the rich narrative of our city. Ruby notes that Waldron surely would have received more due credit during his lifetime had he migrated east to flourishing jazz scenes, making his rare compositions that much more valuable to Seattleites. “Local musicians should be playing these songs because they are part of our heritage,” he says. An acclaimed composer himself, Ruby was able to recognize the brilliance of Waldron’s music and repurpose it with the best modern ensemble Ruby could envision for the vintage era. Audiences of Greg Ruby and The Rhythm Runners’ upcoming shows should expect cleverly crafted tunes and an air of unabashed optimism, unmistakably resurrected from Seattle’s songbook of the roaring twenties. In addition to the listed events, the band will be recording Ruby’s arrangements of Frank D. Waldron’s Syncopated Classic between March concerts.